No Cities to Love has no business being truly great. When a band takes eight years off (and doesn't release an album for ten years), you're usually just happy they're back and touring. Reunion albums are usually filled with songs you have to sit through in between the songs you care about at a live show. 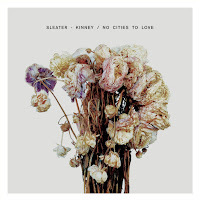 But all of No Cities to Love holds up with everything in Sleater-Kinney's catalog. "Surface Envy" is a driving force of a song. It's the perfect shout along anthem you wish every band had, which is ironic considering another song on the album is titled "No Anthems." "A New Wave" might be my favorite song on the album. I'm only saying might because the video featuring members of Bob's Burgers might be influencing me unfairly against other songs. Comeback albums are a dubious prospect, as are any albums from a band that have been around for 20 years. I don't mind waiting ten years between albums if they'll all be this fantastic.